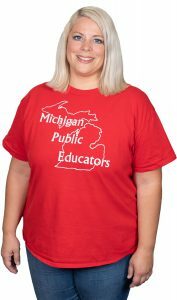 Cassandra Joss, a third-grade teacher in Utica Community Schools, recently made a video to show how much teachers spend on their classrooms, and she appeared on Michigan Radio’s Stateside program to talk about it. How did you get the idea for a video of your classroom with and without teacher-provided materials? My district did some remodeling, so our classrooms had to be completely empty for the summer. Last June I was packing up boxes, thinking, This is insane. Fifty percent of this is school stuff and 50 percent is mine. I knew going in this year that I was going to unpack the school-labeled boxes first and go from there. What motivated you beyond the fact that you could do it with the empty room? Most people say, “Oh yeah, we know teachers spend their own money,” but I don’t think they get exactly how much money we spend and what little we’re provided to do a job. Most people assume when you go into a profession you’re going to be given the resources you need, and we are not. It’s never been that way, and it’s gotten worse, which is crazy to me. I thought maybe I could use that visual to really drive it home. What kinds of materials do you buy for your classroom? Borders, decorations, posters, bins to hold my books, shelving units to hold my books. In the beginning of the year, we’re pretty good on paper, pencils, crayons, scissors, glue. But by January, that stuff’s gone, so I’m replenishing that. I’m buying snacks for kids that don’t have snack. If we have a kid here and there who doesn’t have a backpack or a coat, you get them a backpack or a coat. Another thing dawned on me: indoor recess. What are they going to do at indoor recess? I have to buy board games, I have to buy blocks and Legos. And that may seem silly to somebody else, but really—are they going to sit at their desks for a 20-minute recess? How much do you spend each year would you guess? Because it’s not my kids’ fault. It’s not their fault the state isn’t funding us properly, and they deserve to have a binder and a backpack to keep their things in and a coat to keep them warm. And they deserve to have a Valentine’s Day party and a Halloween party. I am in a Title I school so the parents are struggling themselves. They do what they can, but that doesn’t make it enough and that’s by no fault of theirs. The kids deserve a well-rounded third-grade education and memories. Should you have to spend your own money on your classroom? No. I shouldn’t. I will, and all teachers do. And we will continue to because we have children at the heart of what we’re doing. But we never should have to. View before-and-after video of Cassandra’s classroom at www.mea.org/Cassandra-Joss, and listen to her appearance on Stateside at www.MichiganRadio.org.